During the first round of the 2014 presidential elections, 965,022 citizens – 10.09% of those who cast their ballots inside the country – voted at a different polling station than the one they were assigned to based on their registered home address. These are the so-called supplementary list votes – named after the separate record where these voters have to „sign in” before they can cast their ballot. In the runoff, the number of supplementary list votes went up to 1,190,552, amounting to 10.5% of the ballots cast within the borders. This number seems high compared to what we might think about the number of people away from home on election day, or compared to the 2.13% (108,479 out of 5,096,524 voting inside the country) who voted a similar way in this year’s Hungarian parliamentary election. It cannot be emphasized enough that we don’t know exactly how people on supplementary lists vote. All votes go into the same urn and are counted together. All we is how many people used one of the two lists andwhat the final results are in each precinct, locality, county etc. One other piece of information we do have though is where, in Romania, these people voted. What is more striking is that according to the breakdown from the Central Electoral Bureau, in the first round, 50.3% of those who voted on temporary lists did so in rural areas. In the second round, 49,1% of temporary list voters were again in rural areas. This seems rather surprising. Why are there so many temporary list voters in areas where we don’t expect to see so many students or workers commuting there for work from faraway homes? Clearly, many people simply do not live at their registered address. It may be inconvenient to change registration, or maybe they expect that with an address in a town they have better access to public health services than if they ID showed their actual rural address. We have also heard urban legends about communist-era authorities having put inaccurate addresses in many IDs in villages. All these groups may become supplementary list voters on election day and vastly outnumber the students, commuters and the occasional traveller on the same list. We simply do not know who all these people are and thus whether the typical social profile of all these temporary list voters resembles more the stereotypical image of a Ponta- or a Iohannis-voter remains completely unknown. We can, however, try to make inferences about voting patterns based on other information we do have. The most intuitively appealing approach is to look at the relationship between how many people voted on temporary lists and how many votes each candidate got. 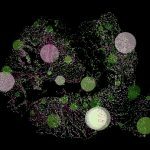 A couple of such analyses, based on county-level data or a handful of localities, have already been undertaken. But we have precinct-level data for the entire country, which represents 18,553 cases. This is what we will use because more cases means more pixels; more detailed information illustrates the situation more accurately, just like a map of locality-level electoral results paints a better picture than a county-level electoral map. Conventional wisdom on Romanian voting patterns says that voters in rural areas lean more towards the social-democratic party (PSD), while urban voters lean right. This is by and large confirmed by the 2014 results. As for fraud, all sides of the political divide have at one time or another voiced suspicions about their competitors, but most media commentary this year focused on the high number of temporary list voters in certain rural areas and implied that they tend to benefit the PSD. Do voting patterns across the more than 18,800 precincts in Romania give us any reasons to support this hypothesis? In fact, the first, simplest analysis implies that Klaus Iohannis, the candidate of the Christian-Liberal Alliance (ACL) may have benefitted from the supplementary list votes even more than PSD candidate Victor Ponta. The trend-line shows a positive relationship between Iohannis’ vote-share (vertical axis) and the ratio of supplementary list voters (horizonal axis). We color-coded the precincts in order to highlight the slightly different trends for town and rural areas. On the whole, Iohannis tended to do much better in urban areas as the ratio of supplementary votes increased, while his vote share in rural areas did not go similarly in tandem with the percentage of supplementary votes. 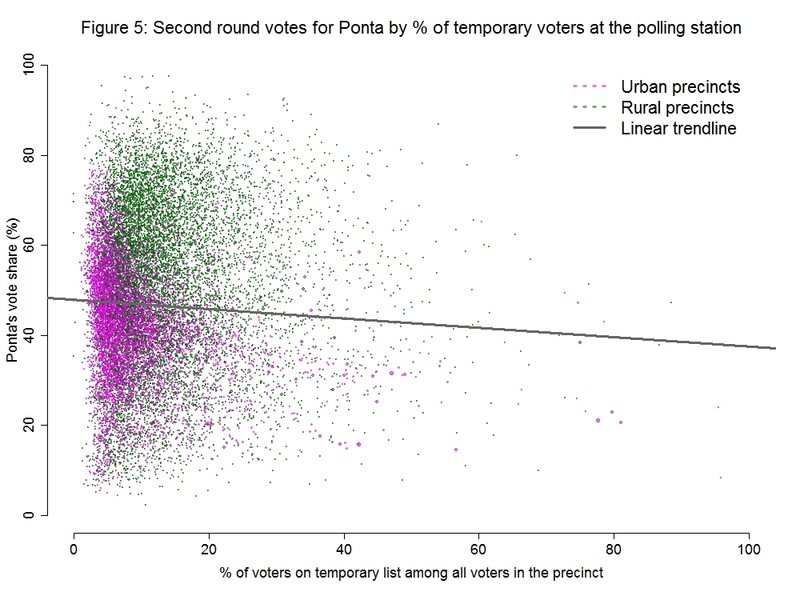 Conversely, Ponta’s vote share in the first round barely increased with the ratio of temporary list votes, and in the second round he actually got fewer votes as the share of people on the supplementary list increased in a given precinct. If we focused merely on the rural precincts, we see that over there Ponta’s lead over Iohannis did indeed increase as the ratio of temporary list voters increased. By way of comparison, Iohannis’ vote share increased by 0.1 percent for every one extra percentage of temporary list voters in the precinct in the first round and by 0.12 percent in the second round. This trend is reversed in favor of Ponta across rural precincts, but amplified greatly in favor of Iohannis if we only consider urban precincts. Does this mean that ballot stuffing with the help of electoral tourists favored Ponta in the villages but favored Iohannis even more strongly in urban areas? We do not think so. It may just be that, entirely independently of how temporary list electors vote, it is the slightly more Ponta-leaning villages where there are many “temporary list voters” who really live there, in spite of what they ID shows. 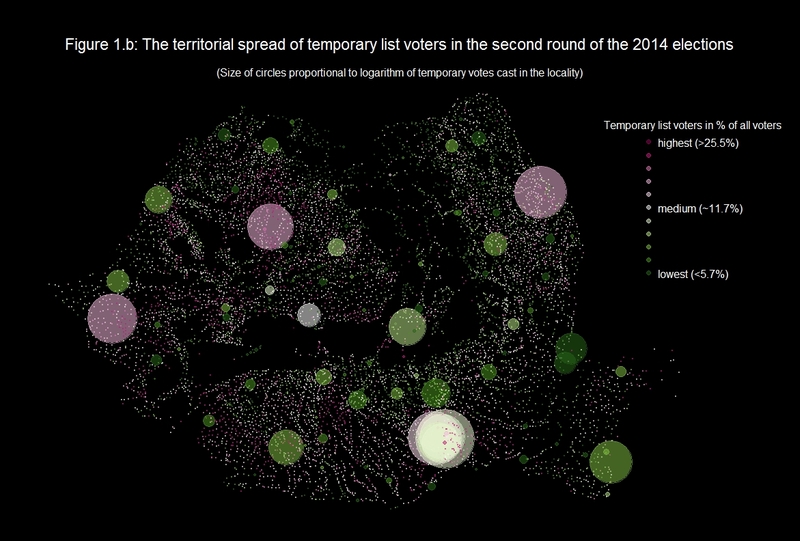 Similarly, maybe towns with many temporary voters are more pro-Iohannis than other towns even without the votes of the temporary voters. 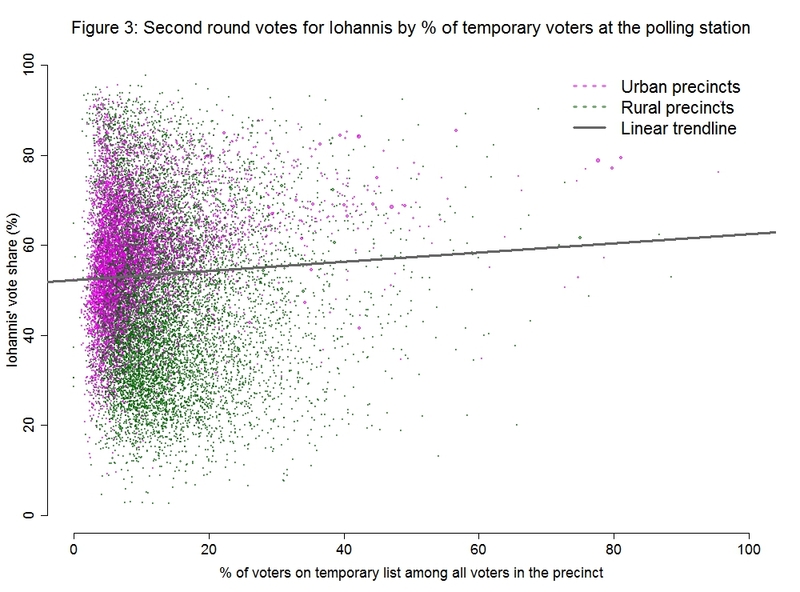 To see whether and where temporary list voters are any different from regular voters, we need to take into account far more information about voting patterns in precincts with different ratios of temporary and permanent list voters. 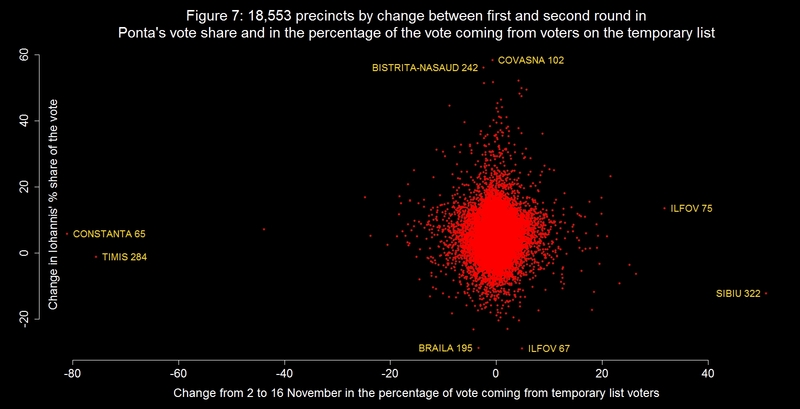 As a first step towards a more sophisticated methods of assessing the situation, we will now look at how changes in the number of people who voted on the supplementary list in each precinct between the first round to the second correlated with changes in the percentage of votes for Iohannis and Ponta on November 16 compared to November 2. What finding would set off alarm bells? If temporary list voters behave roughly the same as permanent list voters, then we should expect to see no clear relationship between these two variables. 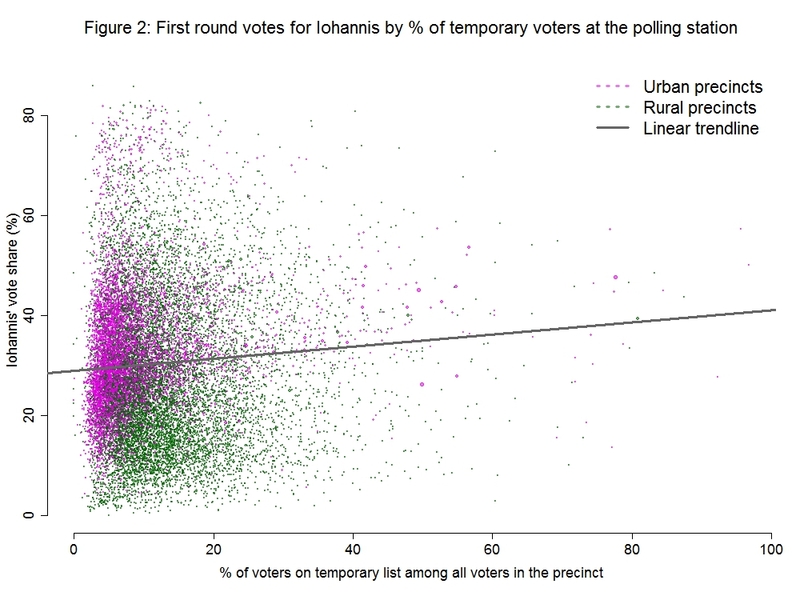 If, on the contrary, changes in the ratio of temporary list voters in a precinct correlate closely with spectacular changes in the vote share of one candidate across the country, then that gives a far clearer sign than anything we looked at before that for some hitherto unknown reason (some) temporary list voters had an unusually strong preference for that candidate. The following two graphs illustrate the change in the percentage of votes coming from the temporary list on the horizontal axis. The vertical axis shows the change in the candidate’s vote share from round one to round two. 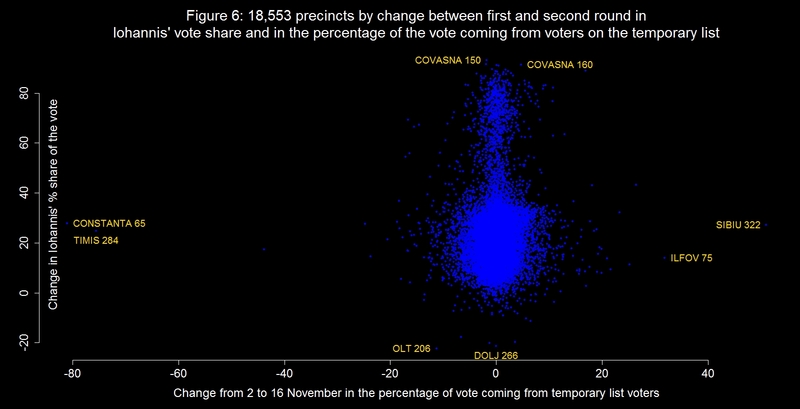 Figure 6 nicely illustrates that a significant number of precincts experienced a rise in Iohannis’ vote share from one round to the next. There is a not at all negligible cluster of precincts where, in the second round, he gained over 60% more votes than he did in the first round, with some of the most dramatic cases occurring in Covasna. This evolution squares with his surprising rise from a distant second to clear winner. On the contrary, by and large, Iohannis upped his game in precincts where fewer people voted on the temporary lists in the second round than in the first round, much the same way he did in precincts where the percentage of temporary list voters increased. Take, for instance, Constanta precinct no. 65 or Timis No. 284, where Iohannis’ vote share rose, even though there was a significant drop in the number of supplementary list voters. In these two cases, he experienced a rise in vote share very similar to what happened in Sibiu No. 322 and Ilfov No. 75, where there was a large increase in the ratio of temporary list voters. On the other extreme, there were also places like polling station No. 206 in Olt or No. 247 in Mehedinti, where Iohannis lost voters between the two rounds but increases or decreases in the ratio of temporary list voters were equally frequent. 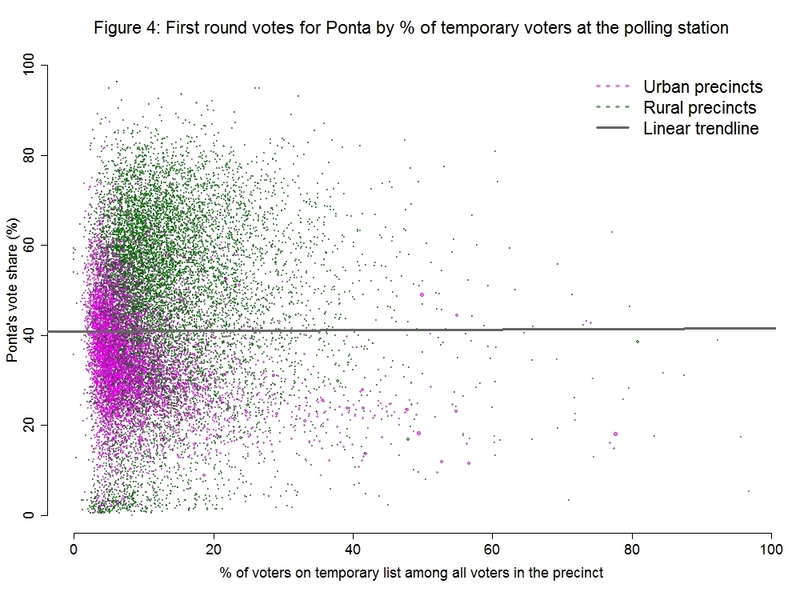 Figure 7 also shows no discernible difference in Ponta’s vote gain or loss based solely on whether the precinct experienced a rise or a fall in the proportion of temporary list voters. While Ponta did manage to gain extra votes in many precincts, he did so less dramatically than Iohannis, and he also lost up to 20 points from his first round vote share in many places. Again, this seems to have happened both in precincts where more temporary voters turned out, and in areas where fewer appeared in the second round. So far, then, our analysis finds no clear sign of either fraud or any hint that ballot stuffing may have disproportionately favored either candidate. In the next part we turn to our most decisive test yet. In total, there were 1,126,284 votes on supplementary lists, but we have to keep in mind that all Romanians abroad vote on supplementary lists, as there are no permanent lists abroad. The total number, together with those abroad, is 1,569,668 votes. Note: All data on the results of the election are taken from the Central Electoral Bureau (Biroul Electoral Central) website: bec2014.ro. Geodata were matched with the addresses of polling stations using the ‚ggmap’ package of David Kahle written for the R programming environment and data from Google Map. With regard to the size of the circles, they do not fall below a certain minimal size, no matter how small is the logarithm of temporary votes in the locality. The map has 9,625 circles, with six of them for Bucharest (for the six districts), but each other town is a single circle. Sizable clusters of proximate localities with spectacularly high proportions of temporary voters can be found in the strongholds of both left (e.g. West of Craiova) and right (North of Cluj, East of Timisoara, all around Sibiu) as well as in fairly competitive territories (e.g. the little violet dots around Bucharest that shine through the big whitish surfaces of the Bucharest districts). Note: to calculate the trendline, we weighted the precincts (and the size of the dots representing them in the charts) by the total number of votes cast in each place, so that we do not give equal weight to a precinct with 100 votes and one with 1,200 votes. Pearson correlation (with precincts weighted by their valid votes in the first round) is 0.04 for Figure 6 and 0.02 for Figure 7. Given the very large N (18,553), both are statistically significant, but so small that we can safely ignore them.